Because that one time you don’t is the time you’ll want them. I couldn’t tell you how many time I packed my sneakers and workout gear when going away for a weekend and it was left unused. For Memorial Day Weekend I went up to CT for a friends celebration. I’m pretty go with the flow on trips and often leave my return trip open for bus or train travel. So Saturday morning I threw 3 dresses in my bag – one for night, one for travel and one for backup. I looked at my sneakers but her gift won space in my bag. I’m an awkward traveler and was already breaking a sweat packing so chose to keep my bag light. So come Saturday night I was talked into a softball game (luckily my friend had an extra pair of sneakers that fit) which lead to go-karting (in a dress thank.you.very.much) that afternoon and boating the next day. I did manage to pack a bathing suit since she has a pool. Full weekend adventures had me returning Monday evening – with my first 3 miles of training to be completed. But I did it and it was even better than expected for being sun-exhausted & dehydrated. So lesson: I will have sneakers with me anytime I stray from my apartment this summer. That said I’m quite impressed with myself how I made it all work. 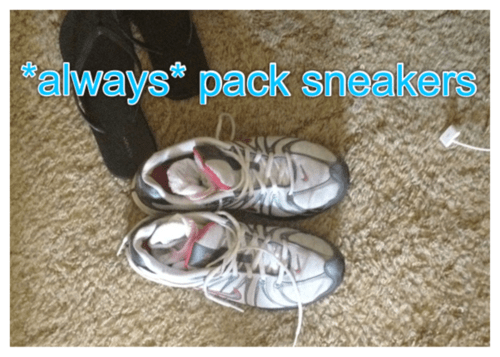 Categories: Uncategorized | Tags: always be prepared, new adventures, running lesson, sneakers, traveling | Permalink.